So far, I've spent nine days in Buenos Aires. It's the first city I've spent any real time in on this round-the-world trip (also did 3 days in Montevideo), and already I want to live here. Allow me to explain. This may take a while. In fact, grab a cup of coffee. Here goes. Last Saturday Talia arrived; we had one night of overlapping surfing, and my host suggested that I make the reservation at Casa SaltShaker for the 3 of us. In walks Talia, a bundle of joy and enthusiasm, traveling alone around South America as she tries to decide whether to enroll in medical school in her native Canada. Within moments of meeting her I said (and I remember my words exactly), "Hey, if you like me, we should travel together!" Those of you who know me (I assume if you're reading this you know me; actually, I assume that if you're reading this we share DNA) probably don't find that so strange - but you may imagine that this was a bit odd for a perfect stranger. Talia took it in stride, and I guess she likes me, because we've been to Montevideo and tonight we leave on a trip to Cordoba and Mendoza! But I'm getting ahead of myself. Before dinner, I met up with Ezequiel, a friend of Erin's who I'd been e-introduced to. He lives in a beautiful apartment in Palermo with an incredible terraza which turned out to be the perfect place to watch the Buenos Aires sunset melt into an inky night sky. Wine, speaking only (well, mostly only) Spanish, sitting outdoors - twas a dream. I'm so glad I met Ezequiel and his friends; they really made Buenos Aires feel friendly and welcoming and young and yummy. Dinner at Casa SaltShaker was delicious and hilarious. Our fellow diners (all English speaking!) were mostly retirees, and I loved hearing about their exotic travels. The food was truly amazing - based, as all of Dan's meals are, on a theme: this time it was the 195th anniversary of the start of Napoleon's 100 days rule (what, you weren't celebrating? ), so all the food was French-inspired. Actually, Dan writes about it beautifully, with pictures, on his blog. At AR$150 with wine pairings (that's US$38.72), this is a 5-course meal not to miss if you're in Buenos Aires! Afterwards our CS hosts, Talia and I went to La Viruta, a classic milonga (tango dance hall) with a large dance floor surrounded by tables. I sat watching for a while, amazed by this thing called tango. I can't think of any equivalent social phenomenon in the States. People, young and old, navigating a huge dance floor that's filled with moving bodies, in a highly specialized, totally improvisatory dance. At first, I thought all of the dancing pairs were also romantic couples - the intensity of their posture and gaze made me think, wow, everyone here is really in love with his/her girlfriend/boyfriend. Then after four songs, they switched partners, and everyone appeared to be in love with someone new! That's tango. I (rather clumsily) tried my hand (feet?) on the dance floor, first with my CS host, who hails from the States and came to Buenos Aires for two reasons: to learn Spanish, and to learn tango. Dancing with him was a great primer, because he was able to explain to me in English what I was doing wrong. Then I danced with Oskar. Oskar is probably about 65 years old, I would guess 5'8" or 5'9", and a solid 230 pounds. He was a great dancer, and very patient with me, explaining essentially what my host had explained in English with the following Spanish phrase, repeated several dozen times over the course of our 4-song encounter: "Yo te llevo" (it really means "I'm leading," but translates more literally into, "I drive/steer you"). The lesson for all you ladies out there is: wait. Don't try to anticipate the steps, or your partners next move...just wait, and he'll do the work and it will all fall into place. It's kind of like meditation in that way: when it's actually happening, it's the easiest, most natural thing in the world. Unlike meditation, tango requires a lot of sweating and embarrassing toe-stomping to get to that easy place. I see how people get addicted to tango! We stayed out dancing until 4am - another "early night!" Sunday it rained all day, and so we stayed in and I made lemon ricotta pancakes before bidding my first BA CouchSurfing hosts adios and heading to my next host's couch in Palermo. I'm not sure what the etiquette is on including names of your CS hosts in your blog, so I'll hold off until I've cleared it with them, but I was staying with two Argentine brothers and their adorable schnauzer, Baco (the dog has signed a release saying I could use his name). Brother #1 was the official host, having just returned from a year of travel during which he was a ski instructor in Colorado and then CouchSurfed through Europe. 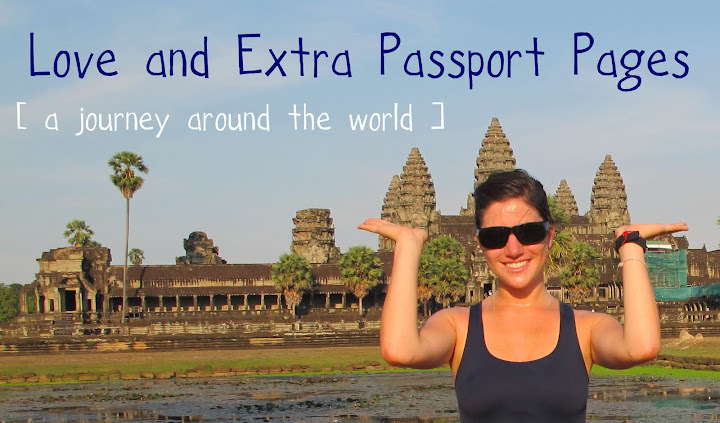 These CouchSurfing folk are really up to amazing things! This is pre-Montevideo sunburn. Just sweaty and happy (oh, and that's Talia and Brother #1). So then we, of course, stayed out until 4am, dancing more. Naturally. This post is getting painfully long, and I haven't even caught up to my first week in Buenos Aires, so I am going to zip through the next couple of days and if you want the deets, email me (or comment on my blog! no comments = I'm a loser blogger) and I'll gladly oblige. Actually, yes. This is a call to action: what do you want to hear about? What's exciting? What's boring? What aspects of the trip should I blog about? You tell me. Tuesday night, the brothers informed me they were heading to their family home in Pilar (1 hr. north of BsAs). Did Talia and I want to come and spend a day playing tennis, ping pong, soccer, etc., and sit by the pool? Yes, yes we did. Lots of hilarity ensued, including Wednesday's epic game of foosball that ended in peace talks and a signed armistice agreement. Returned to Buenos Aires on Sunday for round 2...so much more to say about all of it...hey, let's sit down porteno style, order a coffee, and talk about it for a few hours. Si? Just wanted to say that South America is awesome, everything´s going swimmingly, and I will update you all very soon with Buenos Aires highlights (there are many), my trip to Montevideo (yes, I saw cousin Jake! ), and plans for the next 2 weeks on this fine continent (hint: they involve my good friend Malbec). I´ve got photos and everything. You´re gonna be thrilled. For now, I would like to share this poem that the illustrious Theo shared with me. I have copied it into my notebook and read it often, for inspiration and strength and to be reminded of the beauty of journeying. I made it! My first "official" stop*. I arrived Thursday morning and took the express bus to the city center - a great deal, as the price of the express bus ticket includes a shuttle to your exact address within the city. I mention this mostly because when the shuttle driver asked me where I was from, and I told him New York, he said, "Oh, I lived in New York for a while...in New Rochelle." That is ONE TOWN OVER From where I grew up. Talk about small world. And talk we did. My new best friend from New Rochelle, Omar, and I chatted away in Spanglish (delightful) as we drove through the streets of Buenos Aires. I arrived at my CouchSurfing spot and met my delightful hosts. The thing that's so amazing about CouchSurfing is that you basically have instant friends. I'm staying with two roommates, one from the States and one from Germany, and they're really into the CouchSurfing scene in Buenos Aires, so I tagged along with one of them to a birthday party for another CS'er in a park in Puerto Madera. Bam. Day 1. Friends. The birthday party turned out to be a lovely picnic in Parque Micaela Bastidas, complete with frisbee playing and face painting. One of the chicas I met - roommate of the birthday boy - has moved to BA with her boyfriend...he works in a restaurant...that turned into a dinner invitation to the restaurant that evening! I'm feeling good about my first day already. To top it all off, we went to a hilarious club. Hilarious because, apparently, Thursday night is transvestite night. The ongoing stage show was one of the best costumed pieces of theater I've seen in a long time. Add in the mystery of "is he a she or a he?" and a slamming DJ and it definitely made for an exciting evening. I stuck with my CS host and got home by 3:30am - according to her, an early night. Yesterday I walked around Palermo Viejo (I think it was Viejo) after sitting at a cafe there and watching the world go by for a couple hours. They have THE COOLEST stores here. Clothes, shoes, bags, jewelry. I must come back when (1) I have money and (2) I have room to bring stuff home. Lots of room. Geez louise it was great! Managed not to buy anything, which is a small miracle, considering the number of incredible, relatively cheap, independent, designer-y boutiques I went into. Returned to my hosts' apartment to meet them for a Kevin Johansen concert at Ciudad Cultural Konex, an open-air space where they'd set up bleachers and half a dozen hammocks. We arrived early and got seats - a good move, because Kevin and his band, "the nada," played for more than 2 hours! I really enjoyed his music, especially the way he combined Spanish and English (he's half Argentine, half Alaskan!). He also had a painter onstage, who, starting with a blank sheet hanging behind the band, created a mural bit by bit, changing and adding to it to accompany each song. Kevin + the muralist had a funny rapport. Not that I could understand most of what they were saying (in fast, slangy Spanish), but everyone else was laughing, so it must have been funny. At one point, the two joined hands and took a stroll through the audience (of about 500 people)...I have a couple photos from when they came up into the bleachers...and O.K., I'll admit it, I ruffled his hair when he passed by. By the end of the concert, the mural looked like this! Tonight: dinner at Casa SaltShaker, a puerta cerrada (translation: closed door) restaurant that has 12 guests for a themed dinner in the chef's home! He's an expat from the states, and offers cooking classes in English, so on Monday I am taking his Chilean Seafood cooking class. Much to look forward to! I'm off to explore the city! *My 2 days in L.A. were a wonderful kickoff, thanks to Matthew and Helen, Zander, Eli and Lily, and all the other folks who enjoyed Suzanne's chocolate ganache, not least of all, Suzanne! Thanks, y'all! As some of you know, I am planning a trip around the globe. After finally graduating, I have decided that I am ready to take on the world. Literally. I depart next Saturday, March 13, on a six- to nine-month jaunt around our planet. Needless to say, I am both extremely nervous and extremely excited. I will be a newcomer to just about every single place I plan to visit, so I welcome your advice/suggestions/introductions. And while I can't believe I'm using "blog" as a verb, I will blog the trip here, at www.juliabloch.com. Should you wish to follow along, you will find me (virtually) here. As always, I would love to hear from you about what's going on in your lives. To those of you to whom I haven't spoken to in a while, especially! All this to say: keep in touch.